I love caramel apples, but I don’t enjoy teeth-shattering-caramel. Hee. That’s why I made these little apple bites with a super yummy orange cream caramel dipping sauce. I made this sauce with some limited edition Orange Scream Milk, from TruMoo. 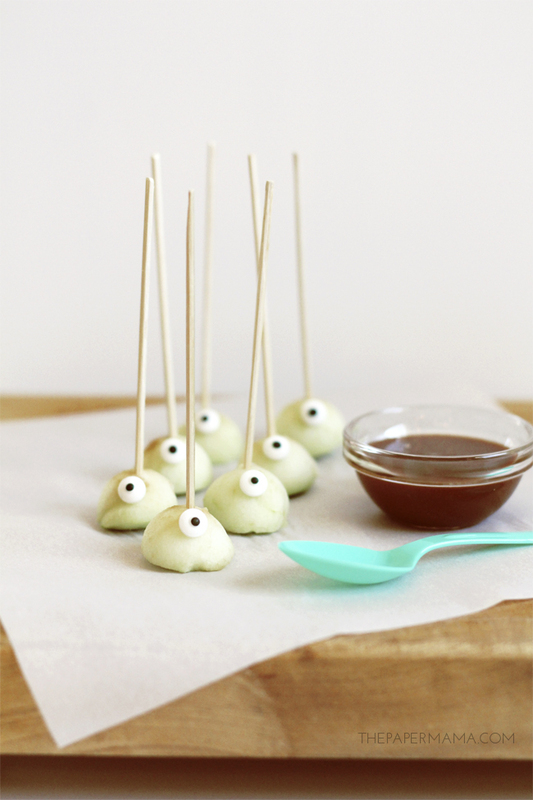 These little “apple eyeballs” will be PERFECT for a little Halloween treat, or just for fun. 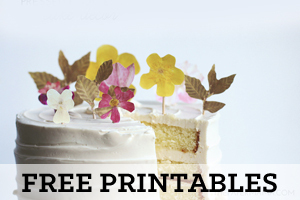 Leave off the candy eyeballs and this could be a cute dessert for any fall holiday. Side note: even though I made it with the limited edition orange flavor, they also have yummy strawberry and chocolate flavor that would work perfect with this recipe. This recipe was adapted from this VERY informative post on the Bright-Eyed Baker. Place the sugar in the Tall, heavy-bottomed pot. Shake the pot so the sugar settles evenly at the bottom. Put the pot over medium-low heat and set a timer for 8 minutes. When the timer goes off, the sugar should look the same. Set the timer for another 8 minutes and be sure to pay attention! Things will start to move fast from here (the sugar will start melting very soon). 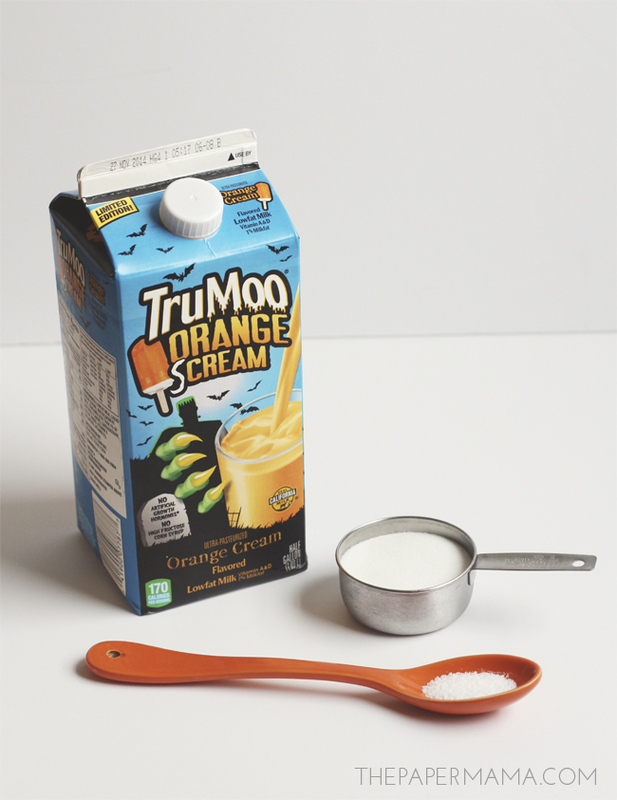 While you’re waiting for the sugar to start melting, warm up the 1 cup of TruMoo Orange Scream in a microwaveable safe container. Use a spoon to stir the milk, set the milk near the stove. Also, place the trivet and oven mit near the stove. Nearing the end of your timer, you will start to smell the sugar heating up. Stay near the stove! It all happens fast. The sugar will start to look translucent and brown in some spots. When you see liquified spots, take your heat-safe spatula and carefully spoon the melted/liquified sugar over the unmelted sugar granules. Continue this step until the sugar melts. The whole idea is to NOT stir the sugar (just spoon the melted over the unmelted), and to keep it from burning. When the all of the sugar is melted, continue to GENTLY stir until the sugar is rusty golden brown. This will happen fast. When the caramel is the appropriate color, remove the pot from the stove and place it on the trivet. Put the oven mit on your stirring hand (this next step can splatter and will burn your hand if you don’t wear the oven mit). Pour in half of the milk and quickly stir. The caramel will bubble and splatter (good thing you’re wearing a mit), and that’s normal. Continue to stir until the bubbling stops. Add the rest of the milk to the pot and stir. Put the pot back on the burner and set it to medium-low heat, stirring constantly. Note: you might see chunks of the caramelized sugar that appeared/are stuck to the pot and spoon when you added the milk. That’s totally ok! It happened to me. You’ll be heating the caramel more on the stove, so the chunks will melt in the next step. Continue to cook the caramel for an additional 10 – 15 minutes (and make sure all caramel chunks are melted). Note: it’s not going to look very think on the stove, but will thicken as it cools. 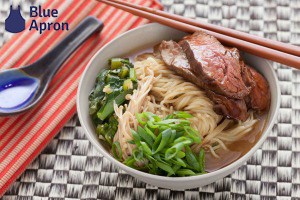 When you’re done cooking, remove the pot from the heat and whisk in the salt. Pour the caramel into a heat-safe container, cover, and let it cool to almost room temperature. When the caramel is cool, it can be stored in the refrigerator. Note: from what I’ve read, the caramel really needs to cool at room temperature. If you put it in the fridge while it warm, it won’t thicken up enough. Peel your apples. 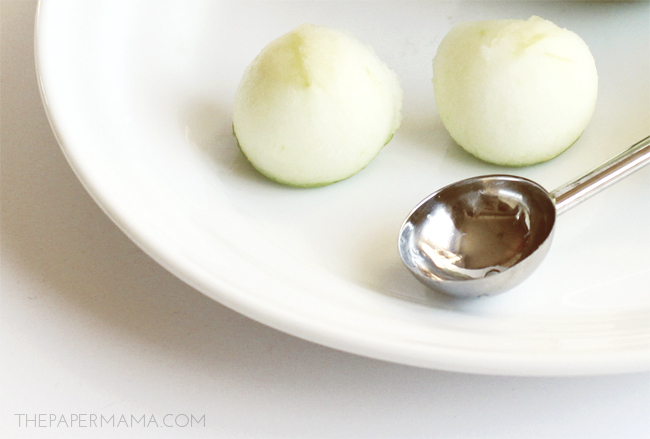 Use the melon baller to carve out little “apple eyeballs”. 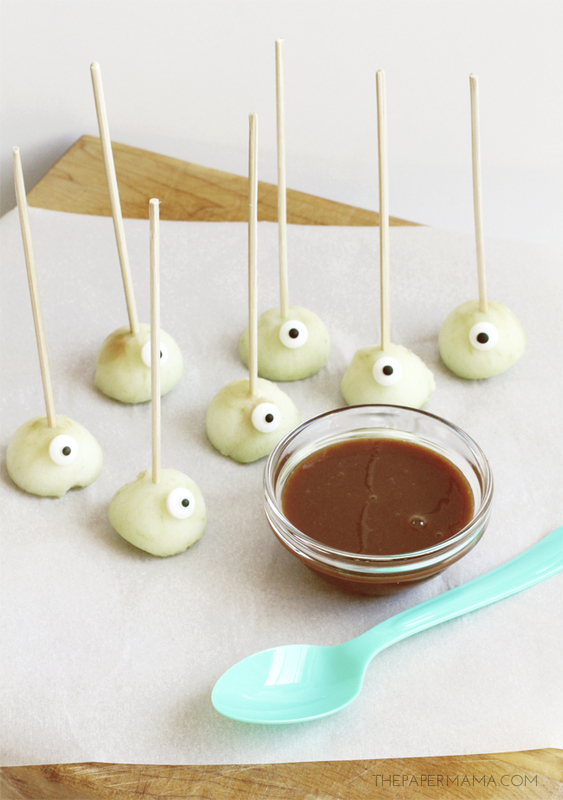 Stick the skewers in the top of the “apple eyeballs” and use a little bit of caramel to attach the eyeballs. Serve the treat with some yummy warmed up orange cream caramel! I hope you enjoy this treat. The cool thing about this dessert is it’s made with apples, milk, and sugar. Not too bad for a dessert. TruMoo does not contain high-fructose corn syrup (a win in my book) and has calcium. Can’t get enough of TruMoo? Follow TruMoo on Pinterest for more delicious recipes and enter the Facebook contest for a chance to win weekly cash prizes through October 31! You can also enter the TruMoo Sweepstakes for a chance to win a family trip for four! 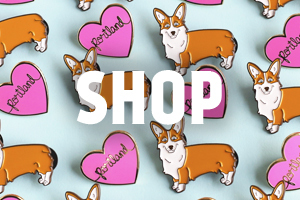 I was selected for this opportunity as a member of Clever Girls Collective and the content and opinions expressed here are all my own. If you would like to check out the past 50 DIY Days projects, you can click on these links: 2011 // 2012 // 2013!